How to select the right Pillow for Stomach Sleepers? There are very few stomach sleepers in the United States. According to a recent study, 63% of Americans sleep on their side, 14% sleep on their back and 16% on their stomach. If you belong to these few people who deviate from the majority, you need to find the best pillow to aid you in your sleep, as most commercialized pillows are designed for the lot. The pillow needed by stomach sleepers is very simple; it doesn’t need to be recommended by a physician and you don’t need anything that are created and designed for those who need support for a number of medical problems. The only pillow you need is one that is not too high as to raise or bed your neck toward the back too much. More of these things will be discussed below, especially if you are a stomach sleeper who seem to can’t find comfort in every pillow you have tried. What are the factors to consider when selecting the right pillow for stomach sleepers? Softness – Stomach sleepers need the softest pillow the can find so as not to put pressure on the neck and face. It shouldn’t turn the heat unnaturally to either side and shouldn’t force the neck to be on an angle. The softness can be determined by how much fill your pillow has. The best one that conforms to your head like a cloud are natural fills. Natural-filled – These pillows contain either feathers, down, or a blend of both. Natural feathers come from ducks or geese and are sourced from the coldest parts of the world. Natural filled pillows are the best for stomach sleepers because they are capable of trapping down air and molding to the shape of your head and neck. The difference between feather and down is that feathers are flat and curved in shape with a quill shaft down the spine. They are firmer and heavier than down so they provide more support. Down, on the other hand, is a cluster with no shaft making it lighter and loftier than feather and the one that offers the softest pillows. MATERIAL - Durable 230 TC Cambric Woven 100% Cotton Casing is the perfect blend of softness and durability. The filling is composed of a 80% down/20% feather blend designed specifically for stomach sleepers. 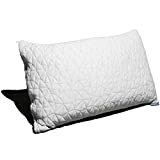 SIZE & FILL SPECS - Standard Size 20 x 26 | 525 Fill Power White Duck Down is less than a traditional back/side sleeper pillow of 600 | Cotton casing weave is tight enough to avoid poking of feathers yet allows pillow to breathe. 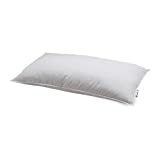 Synthetic/Polyester Filled – This is a technologically advanced man-made microfiber that can also produce a pillow that is very smooth and fine. Sleepers can choose whether they want soft, medium, or firm. This is also good for people who are allergic to natural-filled pillows. When buying synthetic or polyester filled, make sure to pick only high quality ones as the cheaper ones are prone to become lumpy, flat, and uncomfortable over time. Synthetic pillows can be machine washed and dried. Foam – There are normal foams that are comfortable but can easily lose their firmness and there’s the so-called memory foam that took the sleeping world by storm. These spongy foams that molds to the natural shape of your face, neck, and shoulders are great for people on therapy because it offers a lot of support. Memory foam is more recommended for back and side sleepers than stomach sleepers. The latter doesn’t need support for the neck; it only needs a very comfortable pillow to rest on to alleviate pressure. If you really want to try foam, there are shredded memory foam pillows that are suited for stomach sleepers. HYPOALLERGENIC & DUST MITE RESISTANT BED PILLOW- With a hypoallergenic pillow allergy sufferers no longer need to compromise comfort. 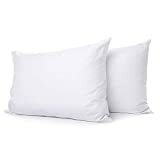 -EASY TO CARE FOR - MACHINE WASHABLE - 5 Year - MADE IN THE USA - Our Pillows and Memory Foam are made right here in the UNITED STATES to our specifications So there is no need to worry about where your pillow came from. Thread Count – Although not as important as the fill or the stiffness of the pillow, the thread count should still be pondered upon as it increases comfort, especially if lying with your cheek down for hours at a time. The higher the thread count, the more durable, plush, and soft it will feel. The usual thread count starts at 300 – this is cost efficient and already comfortable to sleep in. If you want to have a soft and luxurious pillow that feels like the ones in a hotel, go for a higher thread count – around 500-800. If you’re not satisfied enough, there are ones that can go as high as 1000-thread count but it is also equally high in terms of the price tag. What are the pros and cons of sleeping on your stomach? Sleeping on your stomach is good especially if you have lower back pain as it can relieve pressure on your disc spaces. When you’ve been leaning all day or hunched in front of your computer for hours, it’s good to lie on your stomach as it stretches out the backbones and muscles. It is also good for people who snore because face down sleeping keeps the upper airways more open. If you snore and you don’t suffer from any back and neck pain, sleeping on the belly is fine. On the contrary, it is also the sleeping position with the most risk as it flattens the natural curve in the lower back and keeps only one side of your neck turned to the side, which can cause stress on the neck muscles. This position also distorts the natural straight line of the neck and the spine. Key Takeaway: To alleviate this distortion, you need a pillow that won’t put more pressure to your already pressured neck. You only need just one pillow and it should be soft and thin enough as not to raise your neck up too much. Stomach sleepers may be the most difficult position to sleep in, but it’s very easy to find the right pillow for them. The only thing that you need to consider is the softness and the height, so that it doesn’t put pressure onto your neck.